DONATE TO WMOT TODAY AND GET 2 WEEKEND PASSES TO 895 FEST! Get in on WMOT’s Spring Early Bird Member Drive and SAVE! Make a one-time donation of at least $120 and you receive two weekend passes to 895 Fest! Your donation is tax-deductible and gets you invites to WMOT private, members-only events like 895 Sessions, WMOT AmericanaFest events and other member events throughout the year. This offer ends April 26 at 5 p.m.
Click the Donate button, join the WMOT community and get weekend passes to 895 Fest! 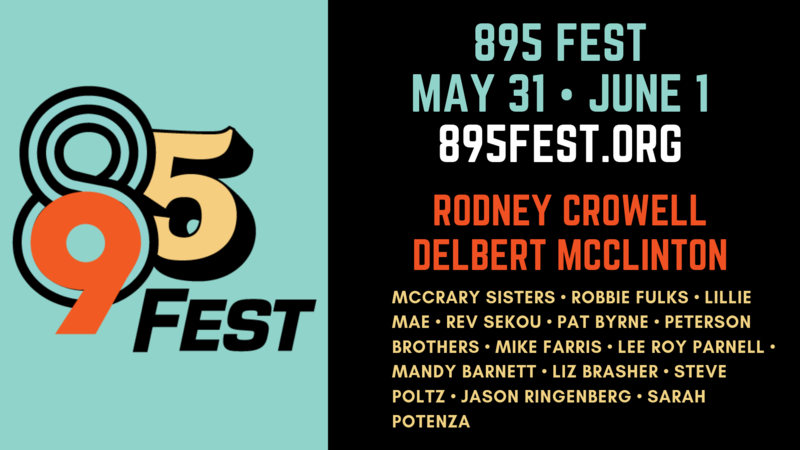 895 Fest is a celebration of our friends, neighbors, heroes and legends over two days, May 31 and June 1, 2019. 895 Fest takes place at Hop Springs Beer Park just a few miles outside Murfreesboro, TN. WMOT Roots Radio is a non-profit pubic radio station broadcasting to 40 counties in middle Tennessee. Choose a weekend pass for 895 Fest. Sure, you can pay full price! We’re excited to announce two days of amazing Americana music. Look for more artist announcements April 22 and May 2! Hop Springs features 83 acres of land dedicated to beer, music and community. 895 Fest will be held in the outdoor amphitheater. Food and drink will be available onsite through our partners, Hop Springs and Steel Barrel Brewing. Murfreesboro offers many hotels just miles from Hop Springs. Some of our partner hotels include Holiday Inn Express and Double Tree. 895 Fest is supported by companies that value music discovery, music experiences and building community. May 31 gates open at 4 p.m. with music from 6 to 11 p.m.
June 1 gates open at 9 a.m. with music from 11 a.m. to 11 p.m. Copyright © 2019. All rights reserved WMOT Roots Radio.